Alabama Gov. 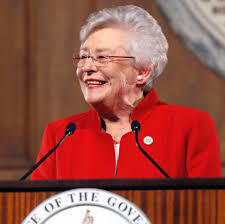 Kay Ivey will take the oath of office this morning as she begins her first full term as governor. The 74-year-old Ivey is the state's second female governor and the first Republican woman elected to the position. The inauguration ceremony will begin at 10 a.m. this morning. Ivey was lieutenant governor 21 months ago when she automatically became governor when Gov. Robert Bentley suddenly resigned in the midst of an impeachment investigation partly centered on his relationship with an aide. She won a term in her own right after defeating Tuscaloosa Mayor Walt Maddox in the November election. Ivey has been in discussions with legislative leaders about a possible gasoline tax increase to fund road and bridge construction, among other possible initiatives.